You’ve waited the whole school year for this night. Now it is time to dress up and dance the night away with your friends. The components of a perfect prom night involve a lot of things: the people, makeup, hair, location, and, of course, the dress. If you are dreaming of the perfect prom dress, be sure to stay on point by knowing all the latest trends for prom dresses in 2019. At Jovani, we have compiled all the latest styles for the 2019 prom dress season. We also offer tips on how to find the winning combo for your figure and skin tone and the different hairstyles that perfectly complement the silhouette of the dress. Want to find that perfect gown? Be sure to check out our prom dresses page! To help in your search, here are some popular trends for 2019. Ball gowns are back, if they ever really left. Ball gowns provide that classic fit and flare look that is flattering to every body type. What is so wonderful about this style dress is that you can find it in every color and print. We are seeing a lot of red, navy, glitter, and floral prints for dresses this year. On top of that, some designers have caught up to 2019 and are including pockets in these gowns. You’ll look great and be able to keep your phone on you to capture the memories! Glitter is here in full force for prom 2019. You’ll catch every eye in a glitter gown! Glitter fabric is huge in 2019 and is appearing on all styles of prom dresses. This includes mermaid cuts, ball gowns, and more. Sparkle your way through prom and make a statement with a glitter dress. What we are really loving is a metallic glitter look in shades of silver and gold. These dresses standout from the crowd for sure. This has been a trend for the past few years and continues to stay relevant in 2019. Two-piece prom dresses feature a cropped top or strapless bodice. This is paired with a long, flowy skirt. We love these because they come in a range of styles, from ball gown flare skirts to a body-con look. Two-pieces are fashionable and trendy while also reusable for different outfits after prom. Two-pieces are coming in a lot of prints and styles, including full chiffon or tulle skirts, floral prints, thigh high leg splits, and more. Illusion gowns are here to make a statement. These designs let you show a little bit of skin but still give off a sophisticated and glamourous vibe. The illusion comes through with delicate lace or beaded accents that bring some dazzle to the gown. These designs can be either body-conscious styles or fit-and-flare feels. Illusion gowns are both trendy and classic at the same time – a great goal for a prom dress. High-low gowns were quite popular a few years ago, but a new twist on this classic look has made its appearance for the 2019 prom season. High-low gowns look like what their name implies – a shorter hemline in the front that fills out in the back. This look is both formal and casual at the same time – and you get to show off your legs. In 2019 these dresses have a new twist with an asymmetrical look to the side. The asymmetrical approach is very eye-catching and glamorous. We are absolutely loving the new take on the high-low look! You’ve probably seen rose gold take over in accessories, tech devices, and more. Well, rose gold is expanding to prom dresses in 2019. Rose gold is such a fabulous color and is making an appearance in all different types of silhouettes and cuts. This color is soft and understated while still being attention-grabbing. We especially love it in some of the sequin print gowns we have. In 2019, it is hard to go wrong with rose gold! Sequins sparkle just as much, if not more, than glitter. We are seeing sequins in many silhouettes – including short bodycon dresses and full-length maxi dresses. We like this trend because it can either be an all-over sequin look or an embellished bodice. One new trend is the ombré sequin look – which we highly recommend. Either way, sequins are dazzling and fun. They come in so many color and style options so there’s no reason not to try it out! Spoiler alert: there is no such thing as a “perfect” prom dress. There is only the perfect prom dress for you! This looks different for everyone, which is why finding a prom dress can be so challenging. You might feel like you have to stay “in style” or “trendy” when choosing your dress, but at the end of the day, it is about finding the dress that makes you excited and comfortable! Finding the right dress for you is also difficult because of the infinite range of options. You’ll have so many styles, silhouettes, and colors to choose from and just one night to wear it! On top of the dress itself, there is also you to consider! The perfect dress for you will need to take into account your body type and skin tone. You’ll want to match hair and makeup to further complement the gown for a flawless look. Oftentimes it might feel like the fashion industry isn’t creating a gown for your body type. It is perfectly okay that not every dress silhouette looks great on every body shape. This is why having options is so important. If you aren’t sure what works for your body type, try on multiple silhouettes! Show off what you love about your body, whether it is your legs or curves or something else! Our design experts at Jovani have created a wide array of options to match any figure with dresses that are flattering to your body and still match your personality. You want to look and feel your best on prom night – and that starts with the dress! To help you get started, here are our recommendations on the best style for different body types. If you are short in stature but big in personality, go for long gowns that make you look (and feel) taller. Shimmery colors like gold and silver will draw the eye in while also adding height. Bold patterns also work here as well as short cocktail dresses paired with heels. One of our favorite looks is a mermaid gown. It’s designed to highlight your curves and create a longer torso look. Prom night is no time to hide – and that goes for your curves! For curvy girls, we recommend solid color form-fitting gowns. For some sparkle, look for dresses with jeweled embellishments. Be careful about where those embellishments are located to make sure they are flattering while also giving off a classic Hollywood vibe. Maybe dresses aren’t your favorite thing and you typically rock a more boyish figure and personality. That is totally fine, and we are excited you want to get dressed up for prom! We suggest shimmery metallic gowns that are form fitting. You can show off and make a statement with these bold but understated metallic looks. If you have a full bust, go for a plunging V-neck or sweetheart neckline to really show it off. Off-the-shoulder looks are also great. If you want to go for a more princess look without showing off the bust, a ball gown with a full skirt in a solid color is wonderful. Don’t feel like you have to draw the eye to your bust just because it is there – remember it is all about what makes you comfortable! As we mentioned, skin tone is also worth considering when buying a prom dress. Not all colors match all skin tones, so we put together a few tips on what works. For the paler ladies, lean towards jewel-toned sapphire and ruby. Light pink, bright pastels, and blue undertones are great too. We also suggest blues and greens, but you can never go wrong with black and white. If you are leaning towards one of the shimmery metallic looks, try silver and violet. If you have a skin tone with pink and peach undertones, try soft pastels, especially lavender, eggshell blue, or plum. For a more earthy, peach tone, try bold and patterned prints. We especially love metallic gold, green, or a striking red. Dark skin tones are wonderful for classic colors like ivory, shimmery gold, or champagne. Golden or reddish tones are perfect here. If you favor bright and bold looks, go for bright red, orange, or yellow. Of course, the hair must match the dress, too. For some girls, the dress comes first, and the hair will adapt. Other girls have a hairstyle in mind and want the dress to match. Either way, your hairstyle on the big night should complement and enhance your overall look. If you have a high neckline on your dress or a lot of embellishment on the top, you should favor an up-do. You already have a lot happening, and you don’t want to make it appear more “busy” with curls covering up part of the dress’ statement. The neck and neckline is the center of attention here. A sleek chignon or tight ponytail will give you a flawless look. If you have a V-neck or scoop neckline dress, try a wavy side hairstyle. These necklines are rather popular and pair well with an up-do set relatively low. It should have a gentle texture and soft look. Low side-swept buns are really great here. A strapless neckline gives a lot of options, especially as you show off the dress and shoulders. Some will go towards a sophisticated up-do while others might prefer a down or half-up half-down look. That hairstyle will draw the eyes to the neckline while simultaneously softening your shoulders. Uncertain about what hairstyle you want? Backless dresses lend themselves toward a variety of hairstyles. There are quite a few necklines that might happen here, but the attention is all on the back. To really show off the design, we suggest an up-do that matches the vibe of the dress. This can be elegant, Boho, vintage, or sleek chic. Crown braids or chignons are always a safe choice. You can also wear your hair down in these types of gowns. We suggest a wavy side-swept look or a braid. You don’t want to hide the design, but you do want to rock the hairstyle you like. Since one-shoulder looks are in, we definitely have to cover asymmetrical hairstyles. The straps vary a lot here – from large ruffles to a simple one-inch strap. Take this into account, but typically you should aim for an off the shoulder hairstyle. The hairstyle shouldn’t compete with the dress but compliment the asymmetrical look. Side-swept French twists or relaxed waves do this very well. Overall, think about what the dress is saying and make the hair match. If you have a classic, elegant vibe, try for a sweeping up-do or retro curls with a statement pin. If your dress is more flowy and relaxed, make your hair match that with a Boho look. 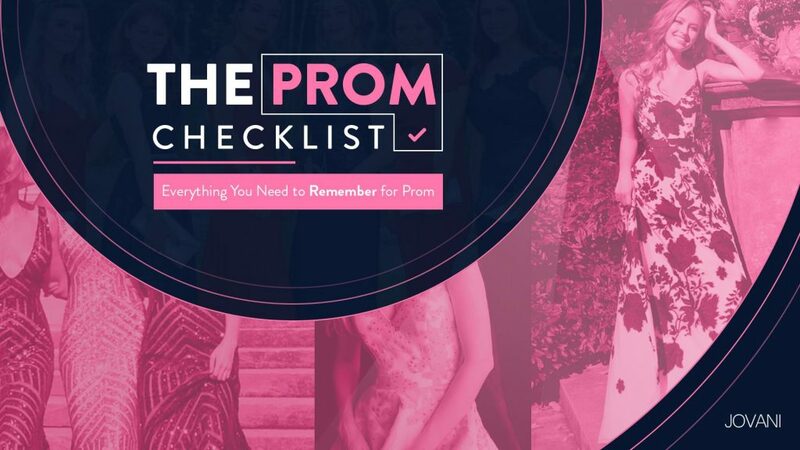 This was our crash course in everything you need to know about prom dresses in 2019. We covered everything from what is in style this season to how to find the right dress for your body type and skin tone. Prom is such an exciting time and shopping for a prom dress should be a fun experience! So, are you ready to get shopping? Check out the full collection of prom dresses 2019 that Jovani has to offer!